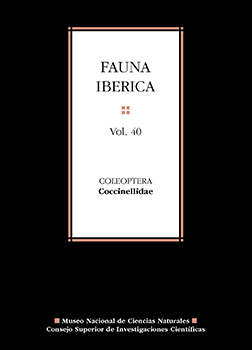 This monograph of the Fauna Ibérica Series is devoted to the family Coccinellidae. It is the first synthesis of the available knowledge of this group of Coleoptera for the Iberian Peninsula and the Balearic Islands and includes the presence of 121 species, some of which are cited for the fi rst time in the Iberian and European fauna. The monograph develops the taxonomy of the cocinelids fauna complemented by extraordinary illustrations: 91 original drawings, 14 of which are color plates, that support detailed descriptions of each species. Dichotomic keys using whenever possible external characters and illustrations will facilitate the identification of species. Information on the geographical distribution at worldwide and Ibero-Balearic region and the biology of the species are also included. The monograph is completed with an extensive bibliography and a comprehesive nomenclatorial list of the taxa represented in the study area which details for each taxon the synonyms and combinations in chronological order. This book was added to our online catalog on Monday 20 July, 2015.